When one thinks of English players in Major League Soccer, the names Frank Lampard and Steven Gerrard immediately spring to mind: multi-millionaire superstars coming to the States for one final pay day and a new challenge. Then there are the likes of the Wright-Phillips brothers (Bradley and Shaun), Nigel Reo-Coker and Giles Barnes: seasoned pros extending already productive and successful careers. 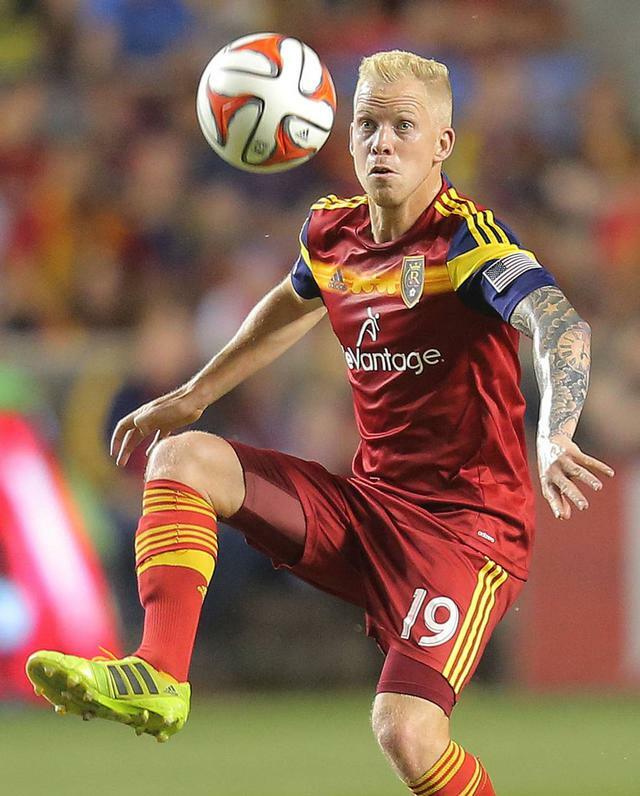 But perhaps the most compelling and inspiring journey of them all is that of Luke Mulholland – the Real Salt Lake midfielder who was not even on the youth team of a professional club in England let alone a senior one. For his is a story of determination and sacrifice, leaving his home town of Preston with barely enough money for a plane ticket to attend a US college on a scholarship before moving up the domestic leagues (winning back-to-back NASL titles on the way) to become one of the mainstays of the Real Salt Lake team. Mulholland may not have the glitz and glamour of his compatriots but he has shown that it is possible to join the US ranks at its lowest level and reach the big time and that, for English players looking for their big break, college soccer is a bona fide route to a professional career. This is a topic BBC Sport touched on earlier this week. Mulholland’s journey from Preston, Lancashire, to Salt Lake City, Utah, began when he toured the US with Preston College and impressed college scouts during a President’s Day tournament in Phoenix and received a number of offers. At the time the 18-year-old was playing non-league soccer for Lancaster City at the weekends – having failed to attract the attention of any Football League clubs – and faced a choice: work his way up the lower leagues in England while holding down a job during the week to pay the bills or continue to learn his craft in the States while earning a free university education at the same time. For Mulholland the choice was simple. “Lancaster City were in the Conference North so I knew I was good enough to work my way up through the leagues but I didn’t see working part-time or full-time and trying to play football was as appealing as playing guaranteed for four years,” Mulholland told the Telegraph in an interview. “I fell in love with the idea of killing two birds with one stone: getting a university degree and being able to play football. I got offers from a few colleges and I went to the one that was able to offer me a 100 per cent scholarship [Wingate University in North Carolina]. At Wingate – where his nickname was ‘Dutch’, a play on the ‘Holland’ in his surname – finances continued to be an issue for Mulholland and he worked as a kit manager to help pay his way. “Because we were on a student visa the foreign players couldn’t get work unless it was on campus,” he added. “So I spoke to the gaffer and asked if there were any jobs and one of them was being kit manager. So every time we were done with training I had to wash the training gear, dry it and hang it back up in the guys’ lockers. In his final year, Mulholland – who as well as being team captain was named a NCAA Division II First Team All-American and South Athletic Conference Player of the Year in 2009 – was forced to juggle classes with going on trial at various clubs. And after three years giving up his Fiat Punto he was finally able to buy a car to enable him to do so. “I ended up buying a Ford Focus the summer before my senior year. Wilmington Hammerheads were the closest USL team – it was a three-hour drive away. So I went there for a week, trained with them and played at the weekend and then came back to college for a week. That was quite tough for the first couple of months but I was able to get through it. At Wilmington Mulholland thrived immediately, winning the 2011 USL Rookie of the Year and was also selected to the league’s Pro Team of the Year. As proud as Mulholland was to win his first professional contract, he was not earning particularly much and even worked as a barman and secretary for a local lawyer’s to help pay the bills. When the 2011 USL season ended, the second tier NASL still had two months to run and his agent was contacted by NSC Minnesota Stars (now Minnesota United) to see if he was interested in helping them reach the play-offs. It couldn’t have gone any better. “I signed for them and was able to help them sneak into the last play-off spot and we ended up winning the whole thing,” he says. After his impressive first season as a pro, Mulholland had hoped he would be getting “a few sniffs” from some MLS teams, as he puts it, but none came. But his disappointment soon turned to joy when in his first year with fellow NASL club Tampa Bay Rowdies he won yet another championship. “I went to New England and Walsall just to train with them for a couple of weeks in the off-season. At the time I wasn’t interested in coming home to England just yet. I just had my first good season in America and wanted to build on that,” he continued. “When I was at Minnesota we played Tampa three or four times and they had a good look at me and knew I was a free agent at the end of the season. A few clubs contacted my agent but I wanted to go to Tampa as they played good football and had an English manager Ricky Hill, who played for Luton Town. Mulholland’s stock was certainly on the rise. At Tampa he scored 17 goals and registered 13 assists in 51 games and became the first player to be named to the NASL Best XI in back-to-back seasons. After three years in the lower divisions, the top division MLS finally came calling and he earned a contract with Real Salt Lake, who had been tracking him and won his ‘Discovery Rights’. “I had never heard of Salt Lake City before I moved there,” he adds. “There was no way my agent could negotiate a contract so they gave me the basic contract for any new player coming to MLS. I ended up taking a bit of a pay cut to come to MLS compared to what I would have got at Tampa had I stayed there. Mulholland is still on his rookie contract, though, and in his spare time he coaches the game to local children. He adds: “I’m not making as much money as more than half the players on the team even though I’m up there with the most playing minutes. I’m hoping to sign a new and improved contract with the team next year so I can connect my future with the club. He has also become something of an internet sensation, and a video of him headbutting a goalpost during a game against Sporting Kansas City quickly went viral. “I remember the ball had been popped up and our goalkeeper went down and the referee hadn’t called anything. From my angle the ball was about to drop right under the crossbar and I saw three blue shirts around me so I tried to jump as high as I could to head the ball out and the ball hit the top of the crossbar and went out for a goal kick. Mulholland is now in his second year at Real Salt Lake and has played against the likes of Robbie Keane, Thierry Henry, Tim Cahill, Kaka, Sebastian Giovinco and Steven Gerrard. He already has Keane and Cahill’s jerseys proudly at home but for the Liverpool fan it is Gerrard’s he craves the most and his opportunity should come this weekend when Real Salt Lake host LA Galaxy. Mulholland was bitterly disappointed not to get Gerrard’s jersey when the teams met in a cup game earlier this season so is determined to swap shirts with his hero. “In the cup game, Gerrard was playing attacking mid and I was playing defensive mid so I was playing against my boyhood hero. That was crazy,” he says. “One of the lads [Javier Moreno] asked him at the 60th minute for his shirt and I was p—- because I’m the only Liverpool fan in the locker room and everyone was talking about playing against him and I was like, ‘I’m going to get his shirt’. To make the game even more special, Mulholland’s mother and younger brother are flying over from England to see him take on former Liverpool players Keane and Gerrard. Mulholland’s journey to non-league Lancaster City to playing against the likes of Gerrard in MLS is an example to many English teenagers who are looking for a future in the game. “There’s so many good players that you play against in your childhood and they end up stopping playing at 18 because they get released from a youth team and you never hear from them,” he says. “I get a lot of people connecting me through social media about coming out here so I try to pass on some advice. By making the decision to try his luck in the land of opportunity, Mulholland has ensured this talent did not go to waste. Mourinho: Diego the Villain? Diego the Mastermind?